I like this a lot! It later drafts, are you considering adding other abilities? Wow - like a lot of your stuff, this is impressively simple and workable. I'm going to yoink! this and mix it in with my mostly-house-rules DnD-like. 1. A response more related to your previous post, so I put it there. 2. Got kind of long so I turned it into a blog post. Basically, I've been working on my own take on a simplified, ad hoc psionics system for D&D style games, hopefully not too edition dependent. If it seems like such a thing might be of interest you can find it here. Brilliant insight saying that precognition is more powerful the closer to the present you can predict. @Christopher: My first aim was to tease out all the psychic-like powers from psionics and leave the Remo-Williams-walking-on-water-stuff for a different system. But it does tame the weirdness of mental powers, no more Expansion and Body Control and such. You could add some of that weirdness back on this base if you wanted. Keep in mind, though, that new players might get this in character creation and 8 powers is a lot to choose from already. Were there powers you had in mind that you'd like to add? @Frotz Self: Thanks so much, I hope it adds to the fun. @Peter K: Thanks for the link I'll take a look. @Michael: Thank you very much. 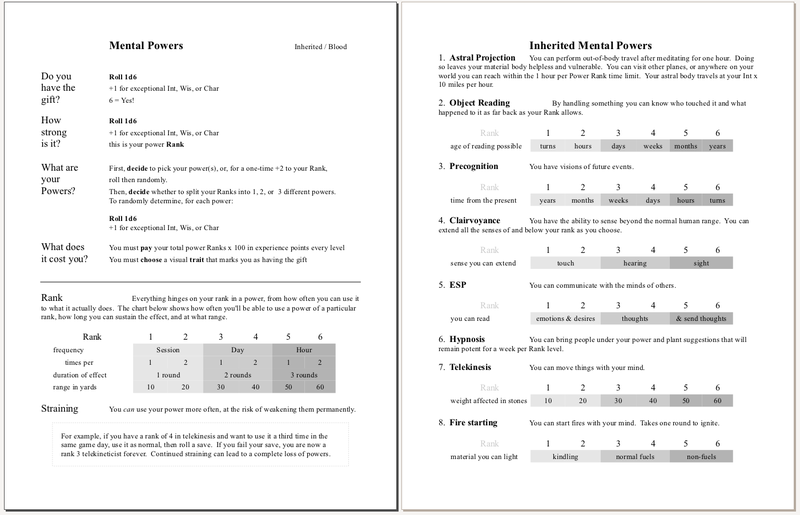 You can see now why I took that whole "3 Ways to Forsee" side trip, I tried writing a one sentence summary for the precognition power and realized I had no idea how to DM it, and that the old game was almost no help. rank = lvl (max. the usual d6 rank roll)? You could do that, and rank=lvl is a nicely simple way to track it. I wouldn't want to do that in my game, though, because I think it erases part of the distinction psionic powers have over magic to me. If you get the gift it's like winning the lottery early on and should be a real boon to survival. 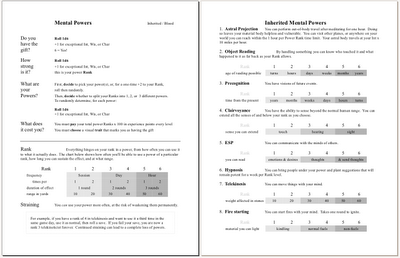 As you level up the powers become less of an issue in the game, unlike all other forms of magic. This kind of power isn't tied to learning, or knowledge or otherworldly power, but just the blood. I know that there's some learning of how to handle powers in the literature, but I'm willing to ignore that here so that the wuxia, fakir powers that are the next component of this are more distinct. The system as it stands is also a way that even low level schmucks can be a threat to higher-ups because of their blood, which is interesting to me, and fuel for possible drama as those in power look for anyone with red hair, or six fingers on their left hand or whatever. Another thing I'm noticing and liking about your set of rules here as I reread them again is how system-agnostic they are. Aside from a couple Attribute and saving throw references, this could be tacked on to any number of other gaming systems without much tinkering. The only power I can think of that I'd add off the top of my head is some kind of mental blast, like Carcosa's 3dx damage to a single character or the 3.0 mindflayer's cone of psychic energy. @Peter: I hope so, most sci-fi type setting will probably have rules for mental powers, but then these might be easier to use. But you could drop these in to a Gangbusters or Boot Hill game for some fun. @Christopher: I plan on psionic blast being an option in mental combat but haven't worked everything out yet. In the mean time, you might replace fire starting with cranium implosion or something, but that would be quite powerful.